TDS on interest paid by banks on deposits of Co-op. Milk Federations, Educational Institutions, Charitable Trusts, trade unions, scientific research association, Local Authorities etc. (iii) any undertaking or body, including a society registered under the Societies Registration Act, 1860 (21 of 1860), financed wholly by the Government. 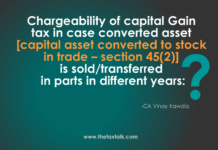 Thus, if the payee falls in any of the above categories (a) to (d) above read with notes, it shall not be liable for TDS on interest income from payer. Previous articleTDS Chart AY 19-20. Whether Partner receiving interest & Remuneration can opt for presumptive taxation for such Income? Whether Audit Report of Trust in Form NO. 10B can be filed after filing Income Tax Return? Interest paid to Co-operative credit societies (commonly known as ‘Patsanstha’) by borrowers – whether liable to TDS u/s 194A? Trust offering income lower than 8%, whether 2 audit required? 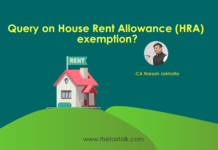 Query on the House Rent Allowance (HRA) exemption?